It was a little tricky getting everything to work right, but once it does, man does it work good. I also included my Nitro controller configuration file so from XBCD you can simply click 'Open' and select the Nitro profile I have made. 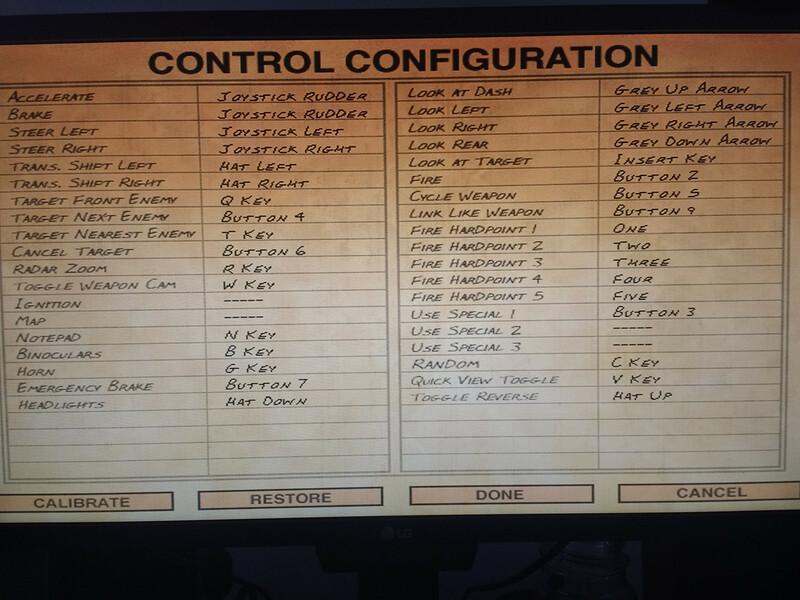 There are also profiles for Carmageddon 2 and other games if anybody is interested. Once you Open the profile, click Apply and you can close the program. You usually won't need to open it again even after restarting windows, unless you want to change the configuration. Happy interstating! I was trying to do more bindings like setup ignition to left stick press but for some reason Nitro doesn't like it when you assign Ignition to Button 9, and it takes away your steering, then you have to re-assign steering to rudder or whatever it is. It does almost everything though but ignition and some other minor things like view and perspective changes. I would love to be able to bind right stick to camera rotation but I think I may need a 3rd program to add that functionality and at the end of the day its not a huge deal. I hope you guys like this. The triggers give excellent control over throttle and brake, and the small thumb joystick is easy to snap back and fourth quickly. One advantage I can think of over a joystick setup is that with a joystick if you have to rapidly turn left and right it will be hard to not also cross into the up down axis and change the throttle from exactly what you want. Similarly if you are going back and fourth between hard throttle and braking, you may end up steering a little bit without meaning to. With separate triggers for throttle and brake, and a separate stick for steering, then they don't influence each other. Obviously not a huge deal, but I think it does help. It might be possible to setup a joystick to get around this but I'm not sure. Also since the thumb sticks are so much smaller than a joystick, you can move them much more quickly and nimbly. Again I'm not trying to start a competition or anything. These are very minute differences, and either setup is vastly superior to a keyboard. I just happened to spend many years playing racing simulators with controllers so I'm very used to them and happened to be able to get it to work with Nitro so I didn't have to buy a joystick. Also I just did a quick google search for "360 controller" and they are going for $10 to $25 bucks for a wired one which is what I use. Not a bad price. It's actually a pretty well designed controller besides the horrific D-pad but luckily its more than good enough for shifting gears and we aren't playing Street Fighter II or Mortal Kombat or Tekkin where a bad D-pad would make you want to end it all.